With days to go until PAX East 2019 begins, the myriad hints and teases have yet to cease. 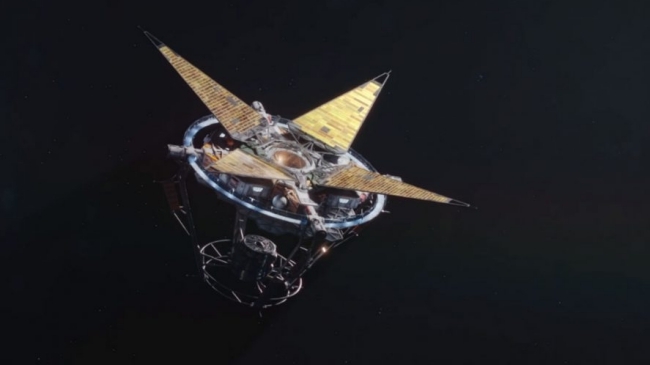 One of the latest teases concerns Bethesda Game Studios’ sci-fi title, Starfield. The game received a surprise announcement during E3 2018. Might it surface once more at this year’s PAX East? According to a survey from Bethesda, it certainly seems possible. The recent survey, which is currently still accessible, asks participants a host of questions about PAX East, all of which are geared towards gauging player interest. 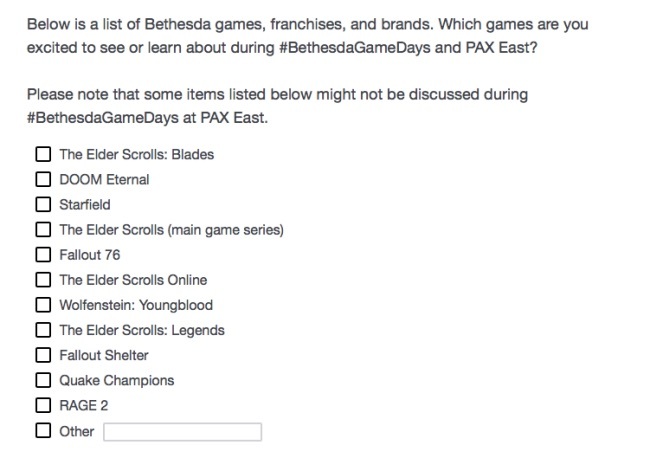 One question in particular asks participants to choose the “games, franchises, or brands” they’re most excited to see from Bethesda at PAX East. The list of choices includes DOOM Eternal, Fallout 76, Elder Scrolls titles, and more. However, Starfield serves as the list’s most surprising entry. In the screenshot pictured below is the Starfield-related question. Another note directly above the list makes it clear that not everything featured will be present during PAX East. Still, the mere mention of Starfield warrants attention. Since the title’s E3 2018 reveal, Bethesda has advised fans to remain patient. After all, the mysterious sci-fi game is still several years out from release. As such, why the company thought it necessary to include Starfield in this kind of survey may boggle the minds of some. Perhaps, in many respects, its mention merely serves as a way for Bethesda to gauge public interest in the title. Regardless of whether Starfield makes a surprise PAX East appearance, Bethesda has big plans for the upcoming event. On Friday, March 29th, Bethesda will host streams for Fallout 76, RAGE 2, The Elder Scrolls 25th Anniversary, and TES Online. The following day will see streams for TES: Legends, TES Online, and RAGE 2 go live. Hopefully, PAX East 2019 will also usher in news about Wolfenstein: Youngblood. Like Starfield, Wolfenstein: Youngblood’s E3 2018 announcement left fans with numerous questions, most of which have yet to receive answers.